After almost a year of hard bargaining and unprecedented mobilization, we have reached a groundbreaking tentative agreement for 21,000 CWA members under the Orange contract at AT&T Mobility. Never before have we seen this level of mobilization for a fair contract, including a three-day strike that shut down hundreds of stores across the country, and never before have we won so much at the bargaining table. Click here to read the bargaining report with all the details. For the first time at any wireless company in the country, workers have won guaranteed customer service work at U.S. call centers, representing an 80% increase in the share of total call volume over the current levels. We also won first-time job security protections and more stable pay and reduced intrusive surveillance at work. If you took part in mobilization activities, walked a strike line, wore a button or a sticker, passed out flyers, or called your managers demanding a fair contract - this is your victory. Our bargaining team could not have achieved this breakthrough tentative agreement without the hard work that you did fighting for a fair contract. We didn't win everything of course, but we moved forward together and will keep up the fight. Please join us for a town hall call on Thursday, December 14 at 8:30pm ET/ 7:30pm CT/ 6:30pm MT/ 5:30pm PTto learn more about the tentative agreement. Text MobilityCall to 69866 to RSVP to the call. Together, we showed that we can beat back regressive proposals and make improvements at work when we stick together and mobilize. Let this be a sign to all companies that put profits above workers: when we stand together, we win. The CWA Political Action Fund (PAF) is the political action committee for the working men and women of CWA, their families, and retirees. Every dollar you contribute to the Political Action Fund (PAF) is put to work building political power for you, your family, and your future. The PAF provides financial contributions to worker-friendly candidates. CWA can only use voluntary dollar’s to contribute to an endorsed candidate for federal office. No Union dues money of any kind can be given to a political candidate for federal office of a national political party. The Political Action Fund (PAF) is fighting to strengthen your voice at work and garner one who have none. The PAF is working to give every patient in NY State the kind of health care we would want for our own families, such as fighting for the passage of the Safe Staffing for Quality Care Act requiring safe staffing nurse to patient ratio’s. Your PAF was instrumental in settling the forty nine (49) day Verizon strike, earning a fair and just contract for our sisters and brothers working there. PAF contributions were used to prevent the Berger Commission from closing two area hospitals staffed by CWA member’s right here in our WNY Community. Most importantly today the PAF is being utilized in our collective effort to insure the Affordable Health Care Act (AHCA) remains the law of the land. Without it our job security is at severe risk, access to quality health care is at severe risk. The option to repeal and replace Obama-care (AHCA) is not an option for CWA members and their families. The CWA Political Action Fund makes politics work for working families. Please complete the Payroll Authorization card you have before you. WHAT IS THE POLITICAL ACTION FUND (PAF)? The political action fund is strictly voluntary. 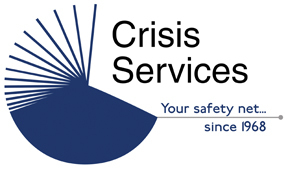 Funds are utilized to administrate and facilitate our political and legislative activities. Pay for grassroots lobbying efforts against privatization and budget cuts, voter registration, and our election day Get Out the VOTE (GOTV) mobilization. Enable CWA to make valued contributions to local, state, and federal candidates who support our issues. Only by electing our candidates will success be achieved. In our current political climate, every one of us is at risk of losing our benefits, job security and rights in the workplace. Each of us has an interest in protecting the jobs of employees. The more money we raise, the more effectively you can protect yourself and your family. 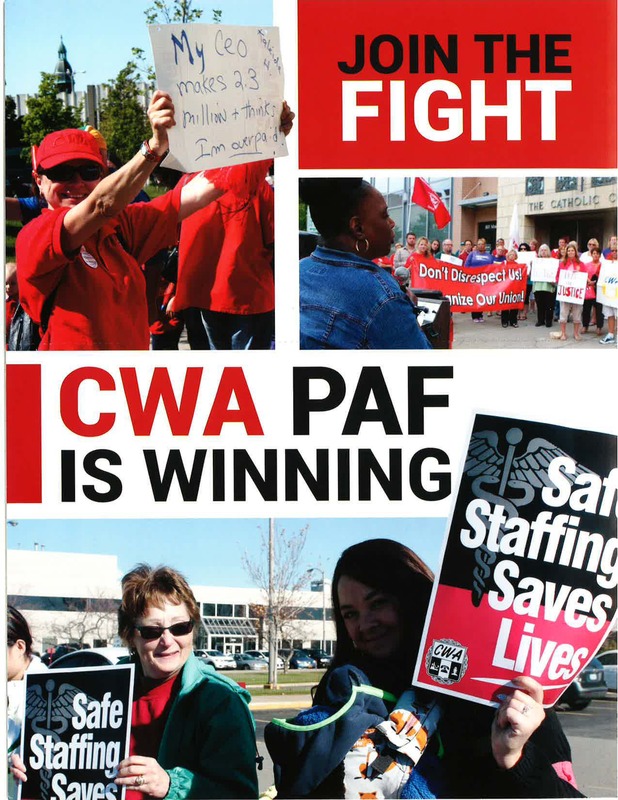 The few dollars we voluntarily contribute to invest in PAF means thousands of dollars in better benefits and better working conditions for CWA members and the working class community. 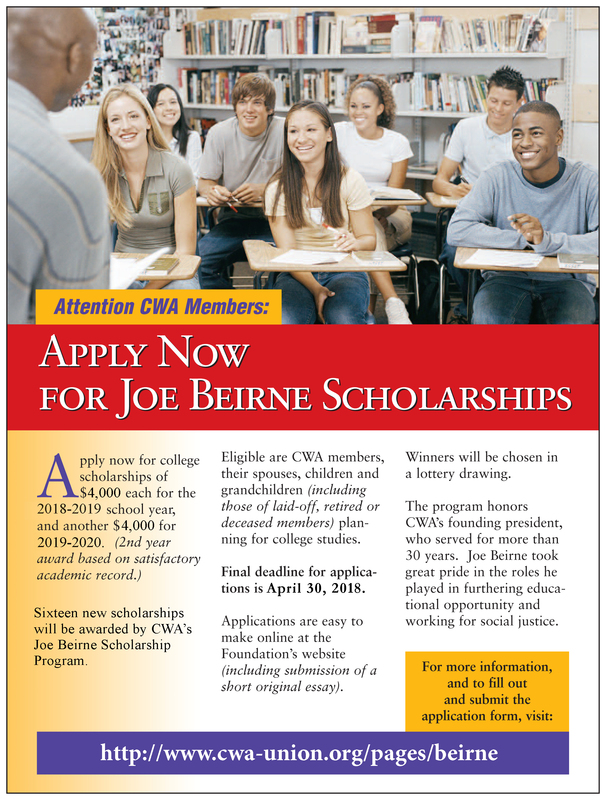 WHY IS CWA INVOLVED IN POLITICS? Indirectly, your bargaining rights, wages, benefits, and job security are all decided by elected representatives. CWA has the duty and obligation to protect the terms and conditions of our labor. In order to effectively do this, we must be involved with electing worker friendly representatives. In our current business and political climate, our involvement is vital as unionized employees are under constant attack, with our careers, our wages, health care benefits, and retirement security all a target. Does CWA just give to DEMOCRATS? No! Our priority is to identify and support pro CWA, pro working class candidates, who will carry our voice, and fight to move our agenda in local, state, and federal government. Politicians are “crooked.” Why are we giving them our money? Not all politicians are crooked, but we need to see that the ones who are do not win. 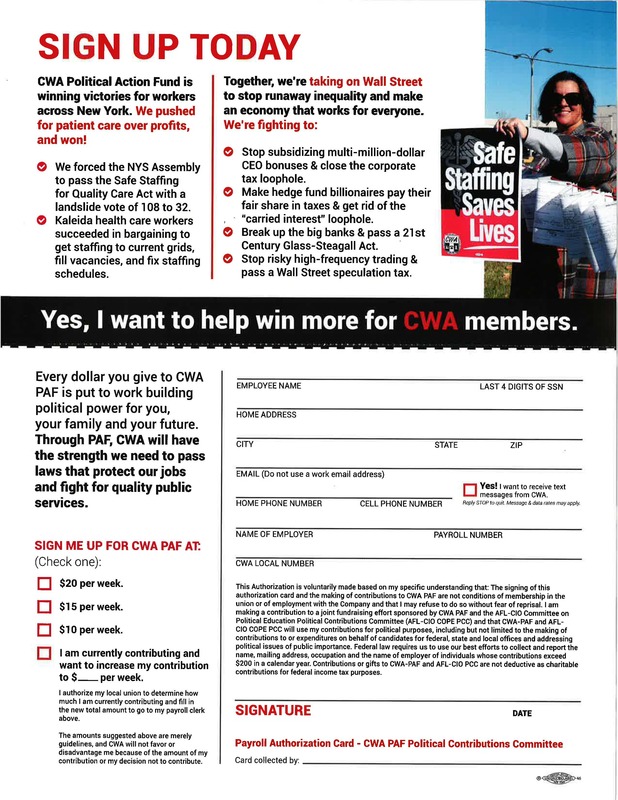 One of the reasons we give money is to help pro CWA, pro worker candidates win. WHEN WE WIN AT THE POLLS, WE WIN AT THE BARGANING TABLE. WHAT IS THE MONEY USED FOR? All of the money obtained through voluntary contributions goes into CWA’s Political Action Fund Account (PAF) and is used for political activities only. This money is not part of the general treasury. The PAF monies go to political candidate contributions, voter registration efforts, education, lobbying, training, and get out the vote (GOTV) work. PAF monies are used to help introduce and pass legislation that protects CWA members, and to influence policy and budget decisions that affect your careers, your families, and your future. A portion of these monies goes to our Federal Political Action Committee (PAC) at the CWA International Office for use in US Congressional or Senate races. WHO CAN CONTRIBUTE TO PAF? Voluntary PAF contributions can be made by all working and retired CWA members and their families, as well as employees of CWA and their families. As you already know, CWA, IBEW and Verizon began meeting for a two-week period to attempt to negotiate the terms of a possible extension to the collective bargaining agreements that are set to expire in August 2019. We have agreed with the Company to extend the negotiations for a few additional days after the holiday. Meetings are expected to resume in the middle of next week. CWA Local 1122 Meeting Dates 2018 STEWARDS Meeting Thursday, January 4 . Without UNIONS, workers will lose many of the protections AGAINST abusive employers. Wages for all will be depressed, even as corporate profits soar. The American dream will be destroyed for millions. And we will have government of the corporations, by the already powerful, for the wealthy. Kenneth Bernstein, Teacher & Blogger, in a 2011 CNN. The CWA Political Action Fund (PAF) is the political action committee for the working men and women of CWA, their families, and retirees. Every dollar you contribute to the Political Action Fund (PAF) is put to work building political power for you, your family, and your future. Today the PAF is being utilized in our collective effort to insure the Affordable Health Care Act (AHCA) remains the law of the land. Without it our job security is at severe risk, access to quality health care is at severe risk. The option to repeal and replace Obama-care (AHCA) is not an option for CWA members and their families. Members of CWA Local 1122 have Weingarten rights during investigatory interviews. An investigatory interview occurs when a Company representative questions a member to obtain information that could lead to discipline OR asks a member to defend his or her conduct. If you reasonably believe that discipline or other adverse consequences may result from a meeting with a Company representative, you have a right to Union representation at that meeting. But, you must request it.